There are some amazing resort/hotel pools in the world. I have chosen these top 10 not just based on the largest but also for beauty and spectacular views. 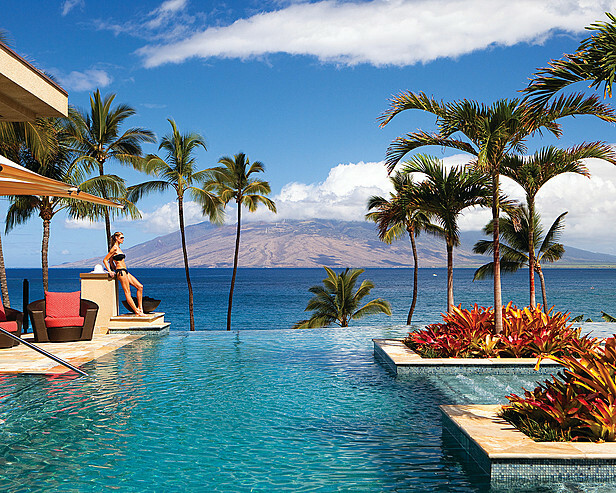 These pools should definitely be on your bucket list! Found at the highest point of Ravello, just past the hotel’s handsome portico bar and lovingly preserved 18th-century drawing room, you access the pool through an alley of roses shaded by a pergola down which rivulets of water trickle. The elliptically shaped pool blends perfectly into its natural surroundings. As you bathe in the gently-heated waters, gazing out to the horizon, sea, sky and mountains all seem to blend as one. The Hotel Caruso Belvedere is set at the highest point in the Amalfi Coast town of Ravello, Italy. Hotel Chocolat is located in the island country of St. Lucia in the Eastern Caribbean sea. 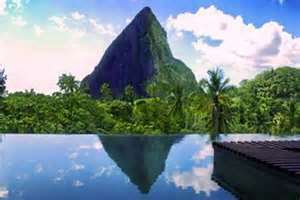 The hotel pool reflects the iconic Pitons and the surrounding rain forest. The pool is lined with black quartz tiles making the reflection look like a mirror. Ten lounge chairs line the poolside pine deck, pretty much assuring time by the pool for every guest of the 14 cottages and cabins. From your lounge, you can request poolside service of chocolaty treats, like a Bellini infused with fresh cacao pulp from the company’s nearby groves. 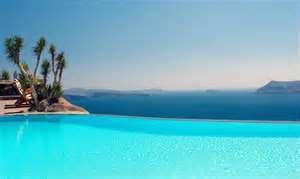 Santorini is an island in the southern Aegean Sea, about 200 km (120 mi) southeast from Greece’s mainland. Perivolas is the ultimate in laidback luxury. Poised on the cliff high above the Aegean. 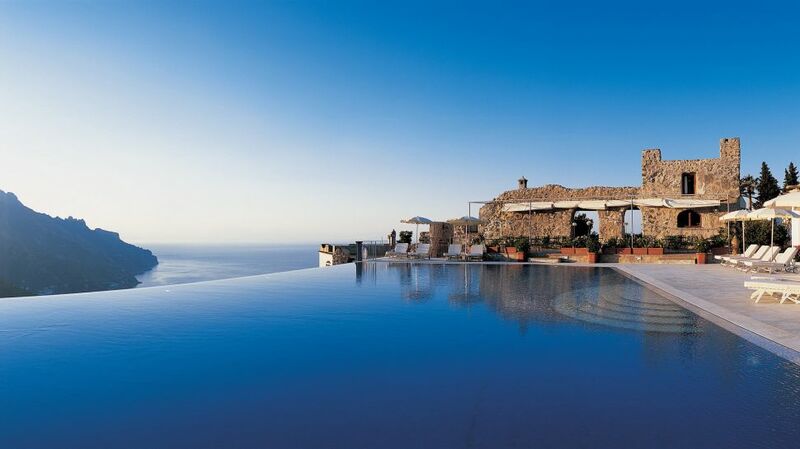 The magnificent Infinity Pool at Perivolas exudes Aegean luxury. It’s simple elegance set in perfect harmony with the majestic scenery defines the true essence of Santorini chic. As a focal point of the hotel facilities, the swimming pool offers a spectacular setting from which to delight in afternoon cocktails and take in the beautiful sunset. Umbrellas and sun loungers offer you the comfort to relax and enjoy the invigorating Aegean sun. 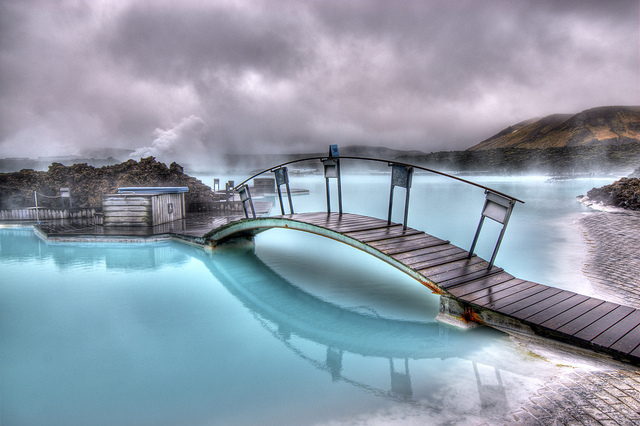 The Blue Lagoon Resort and Spa is located in the Reykjanes peninsula in Iceland. This spa is the world’s only point where the deep sea ridge is coming onto the shore. This massive body of water maintains a warm temperature hovering in the vicinity of 98 to 102 degrees Fahrenheit. The water contains many active ingredients to help guests relax including silica, salts, and blue green algae while white silica mud helps soften and exfoliate your skin. Aside from providing complete relaxation to guests, the water is also used to run turbines that help generate electricity. Mandalay Beach, sits on 11 acres of prime real estate at the center of the Mandalay Bay property. Surrounded by palm trees, fountains and waterfalls, the temperature actually seems to drop inside this pool complex, which is more of a water park than a swimming hole. 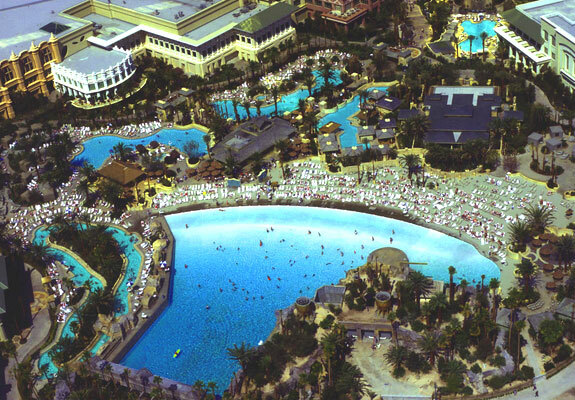 There are eight pools altogether, including a 1.6 million gallon wave pool wave pool with a 2,700 tons of real sand beach, an adults-only pool and some more traditional pools. There is even a lazy river with a 3 mph current, a beachside casino, a retail shop, restaurants and bars. The pool at The Golden Nugget, Las Vegas is a $30 million complex dubbed “The Tank” due to a large aquarium built in the center of the pool. 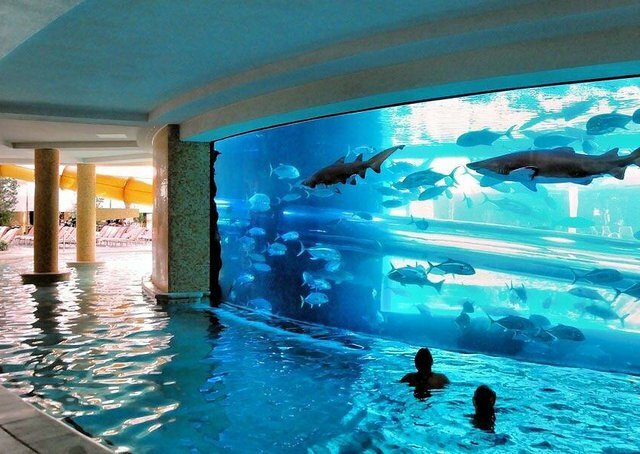 The aquarium in the middle of the pool that holds the sharks allows swimmers to get as close as they want to the glass, and has a glass water slide that goes right through the middle of the predatory habitat—in a word…awesome! There is also a behind-the-scenes tour conducted by the staff marine biologists shows you the inner workings of our incredible 200,000 gallon shark aquarium. 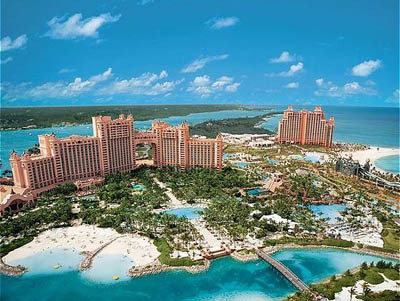 The Atlantis Paradise Island is a resort and waterpark located on Paradise Island, The Bahamas. Officially opened in 1998, the resort was created by South African hotel magnate Sol Ketzner. Aquaventure opened in 2007, 141 acer, 200 million gallon Aquaventure combines slides,lazy rivers and rapids into one large waterscape. The center piece of the attraction is the Power Tower that has four slides. The Current is a mile long, 3 million gallon water ride complete with waves and artificial wave surges. The Marina Bay Sands development in Singapore are three towers with a boat-shaped ‘skypark’ perched on top making this the worlds most expensive hotel. The swimming pool is 55 storey’s up and three times the length of an Olympic pool and 650ft up, it is the largest outdoor pool in the world at that height. While the water in the infinity pool seems to end in a sheer drop, it actually spills into a catchment area where it is pumped back into the main pool. The infinity pool on the roof is in the ‘SkyPark’ which spans the three towers of the hotel. The platform itself is longer than the Eiffel tower laid down and is one of the largest of its kind in the world. San Alfonso del Mar is a private resort in Algarrobo, Chile, about 100 km (62 mi) west of the capital Santiago. The resort is recognized as having the world’s largest swimming pool. The pool is 1 km (0.62 mi) long, covering 8 ha (20 acres), containing some 250,000,000 litres (55,000,000 imp gal; 66,000,000 US gal) of seawater, with a maximum depth of 35 m (115 ft). Apart from its large size, the lagoon has another spectacular feature: its waters have the transparency and intense turquoise color of tropical seas. It uses water pumped, filtered, and treated from the Pacific Ocean. 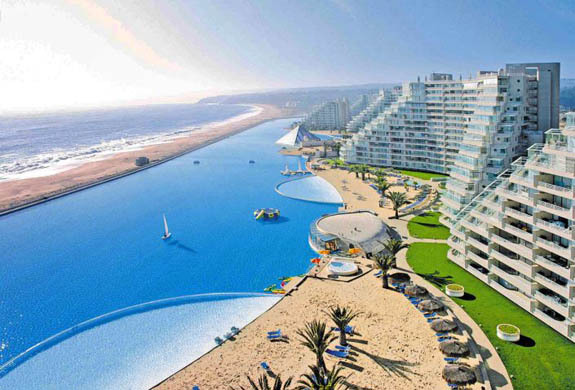 The pool was developed by Chilean company Crystal Lagoons, and opened in December 2006. While early estimates put the total cost of construction at about US$3.5 million for the pool alone,more recent estimates are in the area of US$1.5 billion to US$2 billion total for construction and almost US$4 million in annual maintenance. a new reader. What may you recommend in regards to your post that you made some days ago?